Large Barrier Bags, Over 15"
IMPAK’s Large Mylar® Bags are defined as any barrier bag sized over 15". High barrier bags are used to preserve and protect products such as chemicals, pharmaceuticals, compounds, medical devices, adhesives, automotive parts, machinery, electronics, as well as telecommunications, defense, and aerospace items. These include flat bags and drum liners, in materials over 7.0mils thick, with dimensions over 100". Speak with our specialists about custom films and sizes. MYLAR® is manufactured by DuPont Teijin Films. Great for 5-6 gallon pails & long term food storage. 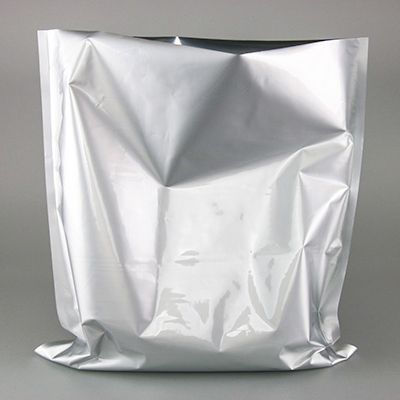 IMPAK (sorbentsystems.com) produces large Mylar® bags for applications ranging all the way from microprocessors to bulk food exporters of nuts and green coffee. Custom sizes are always an option, so please feel free to ask. The photo at left was taken at a recent Packaging Industry trade show and provides a clear visual reference to the range of production MylarFoil bags in inventory. QA test data is available upon request. As you can see, our standard "Large" Mylar® Foil bags range from 18" x 23" to 54" x 48", however, IMPAK offers larger items than pictured. Custom sizes of non-standard dimensions are often produced from specific materials such as our ultra high-barrier PAKVF4PC and represent more than 50% of all production. 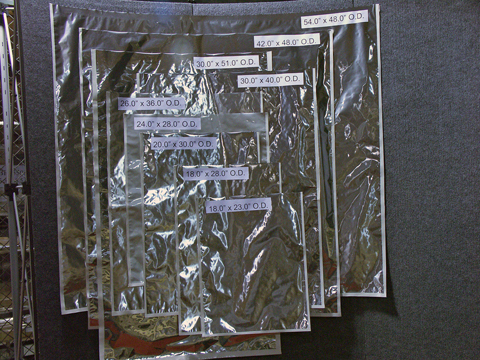 IMPAK also produces many large Mylar® Foil ZipSeal bags. Standard inventory sizes are 3.4" x 4.0" up to 18.0" x 28" in a foil moisture barrier structure and 26" x 36" in a clear barrier structure. Contact our specialists to discuss your packaging needs. Large barrier bags are often used for raw ingredient processing and shipping, as well as long term food storage. Especially with costly products, it is imperative that the appropriate barrier material has been selected. If you are preparing for the possibility of a food shortage or disaster, or if you are processing bulk ingredients, IMPAK supplies the materials necessary for long-term food and product storage. These are general suggestions and may not apply to all applications. If you have different applications or conditions applying to your product preservation you may need a more "custom" storage system. We are glad to answer any questions and help recommend the best storage system for your application. IMPAK provides material specification sheets, readily available online for our most widely used materials. Other material specification sheets are available by request. Please find them here. A sorbent system is a storage method consisting of two parts: a container or pouch, such as a large Mylar® bag, with a high oxygen and moisture barrier, and an oxygen absorber or desiccant. The combination of these two parts provides superior resistance to environmental moisture and oxidation damage. Ask one of our experts how a custom sorbent system can benefit your product. IMPAK produces custom printed pouches and packaging with an emphasis on materials with distinctive barrier properties to protect products from the adverse effects of moisture, oxygen, light and more. Learn about our unique custom capabilities. High barrier bags are used to preserve and protect products. When paired with an oxygen absorber or desiccant, products enjoy even greater shelf-life and stability. However, selecting the appropriate package is not always as straight forward as it seems.